Investors typically make money when the assets they own increase in value and/or when the assets they own deliver dividend, interest or rental income. When combined, income and price returns results in the total returns equation. One asset that has generated positive total returns every year since 2000 is gold. Investors who bet on the yellow metal have generated 17.70% annual returns over that period. Right now the precious metal is hitting all-time highs, as many investors expect that the amount of monetary stimulus by the Federal Reserve would create massive inflation in the US. This speculative frenzy is catching up quickly, as investors bid up gold through one of the many vehicles available to dabble – gold etfs, gold futures, physical gold etc. For example, one of the largest ETF's in the US with over 50 billion in assets is SPDR Gold Shares (GLD), which allows investors to easily gain exposure to gold. In reality however, there are very few reasons to own gold, besides the expectations that it would hit some magical high point because the imaginary printing press of the FED would create massive inflation. Gold is typically perceived as a store of value and as a sort of international currency. When discussing gold investment returns however, it is obvious that years of great returns are followed by years of poor returns. It is important not to make conclusions based off a limited number of data sets exactly for this reason. Investors who chase gold higher, touting its investment performance over the past decade, should not ignore the fact that investors who purchased gold 30 years ago would have made only a 75% return. An investment in Treasury Bills or Certificates of Deposit would have outperformed the yellow metal over the same time period. So much for gold being a store of value. However, if we extend the investment horizon to include the past 36 years, we would notice that gold produced very decent returns overall. In addition to that investors who own gold, end up paying up either for storage and insurance, or management fees if they invest through a gold ETF. 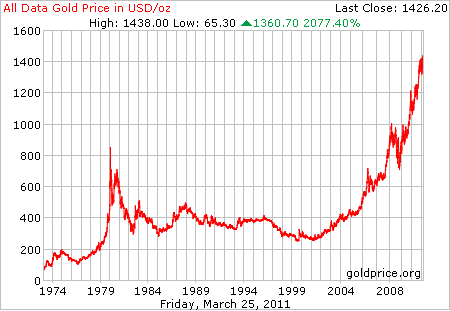 Gold does not produce any income, which is ironic since it is touted as a stable currency. Every currency, stable or not could generate some sort of income return over a period of time, except gold. That’s why gold is particularly unfit for those who want to live off their assets. It is true that investors could sell a chunk of their gold each year in order to meet their expenses, but this would leave investors with a diminishing amount of gold. The rate of decrease of the amount of gold holdings in your portfolio would depend on the fluctuations in the commodity markets, which have been analyzed for centuries by market technicians, astrologists without any breakthrough as to where the prices will go next. To most dividend investors, owning gold doesn’t make much sense, since it is not an asset that produces income or generates any profit or economic/social gain to society. Owning gold makes as much sense as stocking up on toothpaste and calling yourself a toothpaste investor. I would much rather own an asset that not only could generate potential capital gains for me but also pays me to hold it. Dividend stocks are one such asset. The best dividend stocks have strong competitive advantages, which allow the companies to pass any cost increases to consumers, which lets them increase profits over time. This leads to a higher dividend payment over time as well, which provides an inflation adjusted stream of income. In other words, investors in dividend stocks would not have to sell off their holdings, in order to meet expenses. They could just pick the right dividend stocks, create a diversified dividend machine, and live off dividends. Some of the best dividend stocks that I focus on are great inflation hedges, as their dividend and earnings have grown at or above the rate of inflation over time. They produce real goods or services, that provide value to their users, who are willing to pay the right price for quality. I do not recommend purchasing Tylenol or Gillette products as an investment. I would much rather own the companies that produce those everyday products, and profit along the way. Full Disclosure: Long all companies mentioned above. I don't own any gold.